Can an iconic rock band that’s lost a key member continue? Or should it? Founding members of the Who — Pete Townshend and Roger Daltrey — have kept that band alive despite the deaths of drummer Keith Moon in 1978 and of bassist John Entwistle in 2002. The Grateful Dead essentially retired that band’s name after lead guitarist Jerry Garcia died in 1995. Queen has found new life and new fans touring with “American Idol” alum Adam Lambert singing the parts originally voiced by Freddie Mercury, who died in 1991. And now the Eagles are about to fly again without a musician widely viewed as its leader and chief musical architect. 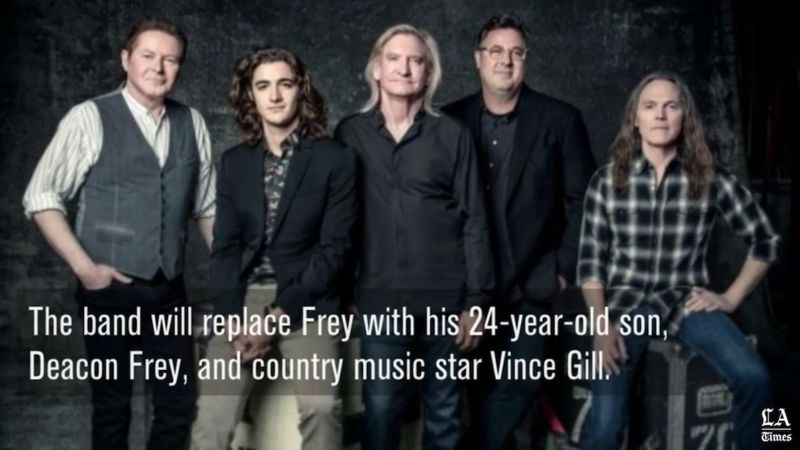 Surviving members have turned to one family member and one longtime friend to help it through this transition: Deacon Frey, the 24-year-old son of Eagles co-founder Glenn Frey, who died last year, and country music star Vince Gill. The quintessential Southern California country rock ensemble formed in the early 1970s in Los Angeles and is set to headline a two-pronged, bicoastal festival: Classic West and Classic East, alongside Fleetwood Mac, Steely Dan, Earth Wind & Fire, the Doobie Brothers and Journey. Deacon Frey and Gill will divvy up lead vocals on the songs Glenn Frey sang with the Eagles. “While I was still in shock during some interviews after Glenn passed away, I did say that I thought that was the end of the band,” Don Henley, 69, said recently after rehearsals for the upcoming festivals, set for July 15 and 16 at Dodger Stadium and July 29 and 30 at Citi Field in New York. To hear Henley — and Gill — tell it, it’s the prospect of keeping Frey’s songs alive that has motivated the decision to move forward. Read the full article on LATimes.com.